Francisco Chávez-Silva first met Macario at a workshop at the Emma S. Barrientos Mexican American Cultural Center in Austin. It was a workshop led by Oaxacan artists who taught the participants to make alebrijes—small, buy wooden sculptures of fantastical creatures. Macario, a Mexican immigrant with a serious, dry demeanor, a history of addiction and a case of terminal cancer, was at the time a resident of Casa Marianella. According to Director Jennifer Long, Macario didn’t talk much to anyone back then, but for some reason, as they went through that workshop together, he took a liking to Francisco. Francisco himself emigrated from Mexico in 1992, with his wife Lucía Chávez and their two children. 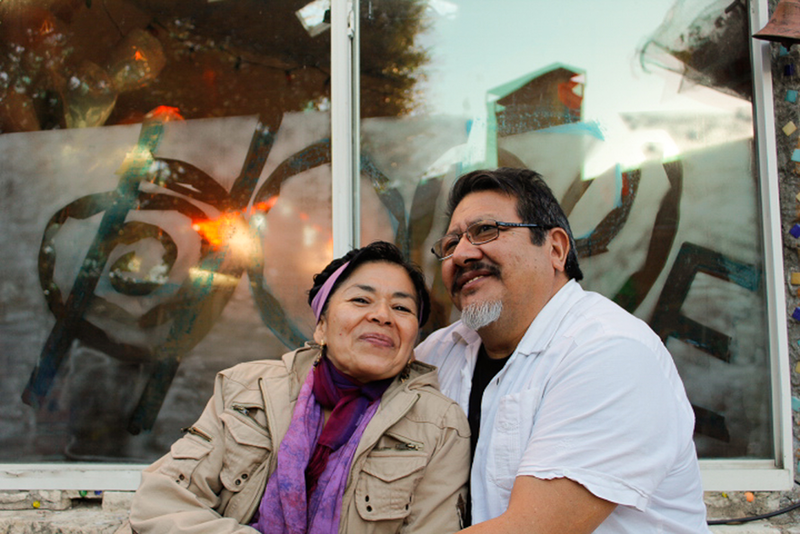 Both professionals, Francisco worked in Mexico as a piano tuner, and Lucía as a teacher. They came to the US with tourist visas, but Francisco planned to work with his friend, a master piano technician at Baylor University. This hope was dashed, however, when the friend died unexpectedly. Francisco and his family now found themselves undocumented in Austin. Like many immigrant professionals, they suddenly had to accept any work they could get. Francisco washed dishes, and Lucía cleaned houses. They debated whether to return to Mexico, where they could practice their trades, but where (as Lucía saw it) their kids would get an inferior education. Francisco eventually did return to Mexico temporarily, to tune pianos and save up money. Buoyed by the dignifying experience, he returned ready to convince Lucía to come back to Mexico with him. At this point, however, Mexico underwent a major financial crisis, provoked by an arrival and subsequent flight of foreign investment during the year of NAFTA and the Zapatista uprising. The economy tanked, and Francisco and Lucía decided the US is where they would stay. Without resources or connections, Francisco determined to work in his field, one way or another. While painstakingly trying to fix a piano on contract in the family’s tiny Austin apartment, he began to fall into a depression. It was at this point that a friend would recommend he take English classes at El Buen Samaritano in South Austin. There, over the course of years, Francisco’s skills would lead him to a full-time job, playing and teaching music, and working with the Spanish speaking congregation at their partner church: St. Francis of Assisi. Eventually, he would even get legal documentation through this job for himself and his family. It was after this turning point that Francisco met Macario at the woodcarving workshop at the MACC. 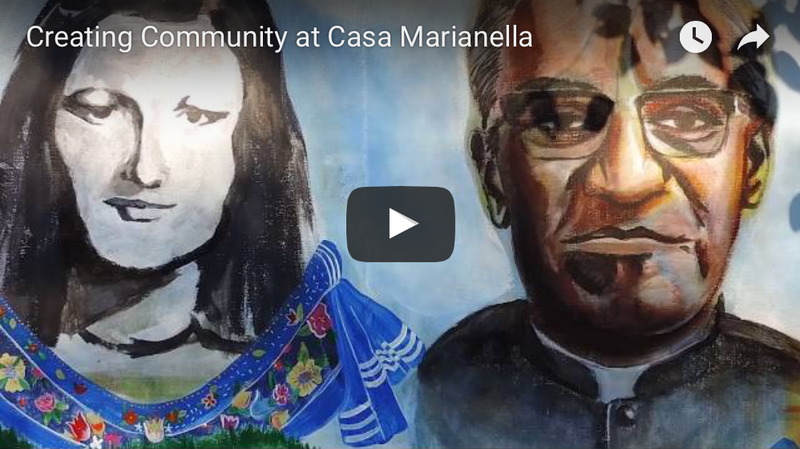 Francisco had known of Casa Marianella through his congregation work, but now, because of Macario, he started to visit more often. 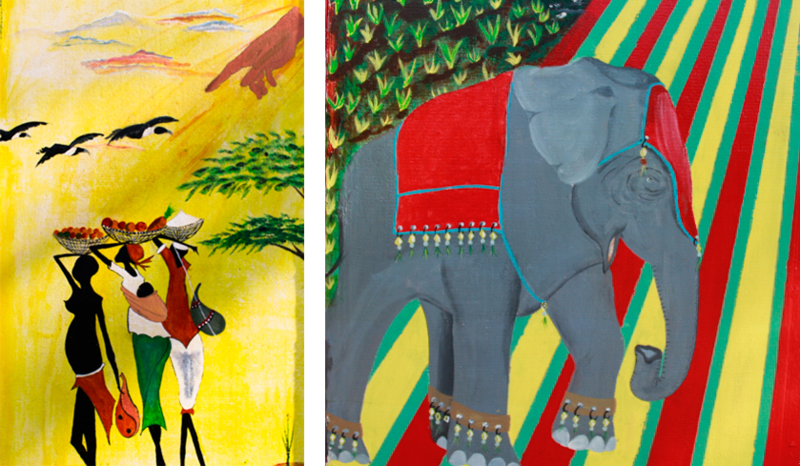 He would do little art projects with Macario, or play guitar and sing, which would attract the other residents. As he spent more time there, a couple of projects came to mind. The first can be seen directly in front of Casa’s main house, where a small white bench sits before a shrine of the Virgen de Guadalupe. This Virgin was at one point an abandoned ornament near the Casa herb garden. 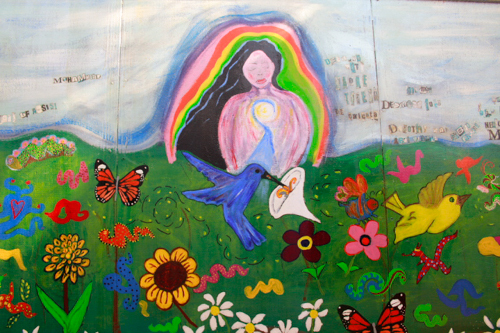 At the request of a long-term Casa volunteer, Francisco drew up plans for a shrine to house the statue, and Lucía repainted it to the color it is today. They then, on December 12th (the day the Virgin appeared to Juan Diego), led a group at dawn to sing before the shrine. Macario, whose health was now failing, attended in a wheelchair, covered in blankets to ward off the cold, dark morning. He would die eight days later. The second project, then, would be a sort of memorial. 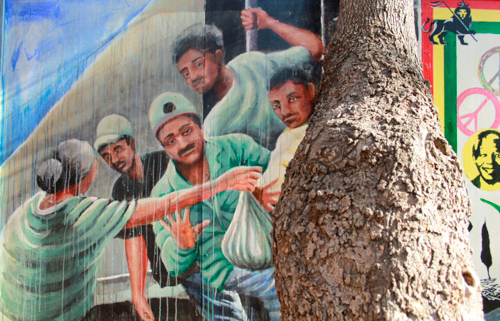 As Francisco puts it, “Macario never made it to the mural, but he was like the spirit that carried me forward.” If you’ve ever been to Casa Marianella, you’ll notice to the side of the main house a long mural running along the fence. Francisco, with financial support from Casa, and help from a stream of staff, volunteers, and outside artists, coordinated this project which today visually defines the shelter. Unrecognized by most, on a small, red panel of the mural, there is a rendering of a dragon-like creature, which is a copy of the alebrije Macario made on the day he and Francisco met. Today, Francisco works for St. James Episcopal Church and also tunes pianos for San Antonio University. Lucía, meanwhile, continues to clean houses, a job which she says gives her the flexibility to pursue her own artistic endeavors. Together, they come once a month with St. James for Casa’s Convivio celebration, where they provide music. 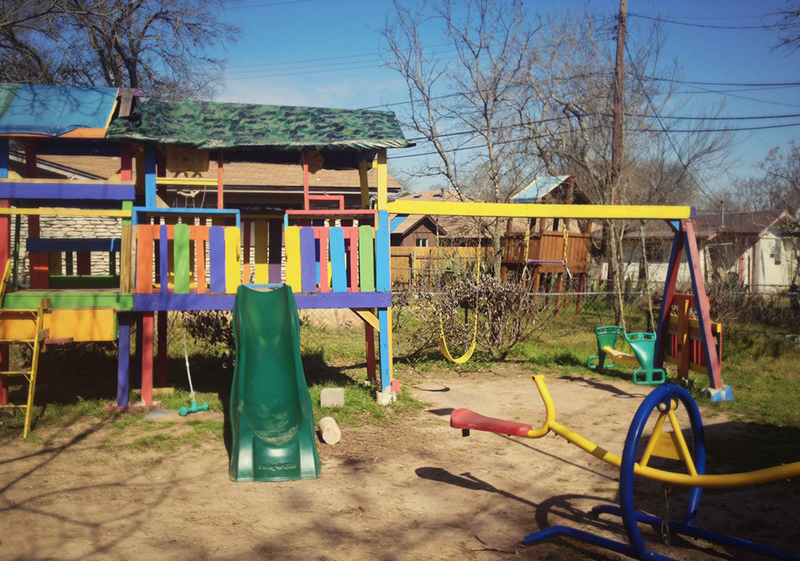 They’ve also started to help out at Casa’s partner women and children’s shelter, Posada Esperanza, where they recently helped install an artisan-made piece of playground equipment. At Posada, which is much newer than Casa, they say they might even have plans for a second mural.